Smashing test, passign with one fault. There aren't many people who could deal with my stubborn ways when it came to learning to drive, but Hannah took a friendly, bubbly approach and managed to get me out of my bad habits in the relatively short 7 hours I spent with her before my test. She instantly puts you at ease and is understanding of the little mistakes, while helping you to understand what went wrong, why it's wrong and how you can improve, without being judgemental or pressuring. I genuinely don't think I would've ever been able to pass my test, especially with only one fault (My bad), without Hannah's professionalism, approachability or understanding. Thank you Hannah! I am very happy with the quality of instruction I received from Hannah. It took some time for me to find the right instructor, but I am really glad I contacted Hannah. 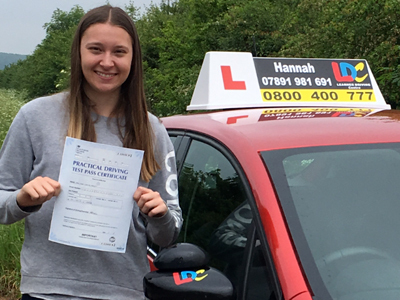 As a student who had foreign driving experience, Hannah adapted her lessons to focus on what I needed to practice most. Her instruction was indispensable when it came to taking the test. I found the LDC system very easy to follow. The workbook was particularly helpful. Having a clear outline of the instructional material allowed me to work through the lessons ahead of time and at my own pace. Hannah and I could then focus on driving during the lessons which was ideal. I would whole heartedly recommend Hannah to anyone who needs a driving instructor. Hannah’s a very good driving instructor. I have learned very quickly how to drive and would recommend her to anyone. The system she used through LDC works very well and is very in-depth, the book and DVDs are very helpful too. If your looking for driving lessons use Hannah Nelson and LDC. Thank you again for helping me to pass my driving test. Being 40 years old it was vital I found the right driving school to pass with. 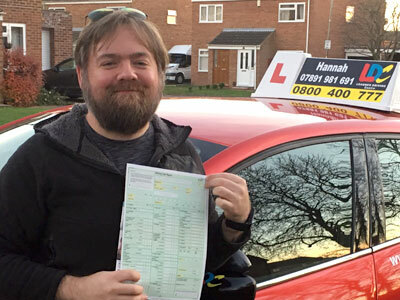 Having looked at all the driving schools in Oxfordshire I came across Hannah's LDC driving school and liked the idea of the course material and the method that was used. The way you work though the LDC workbook and watch clips of what is planned for the next lesson really helps focus on putting it into practice in the car. The pupil decides the lesson plan it's all done at your own pace. So you learn the manoeuvrers right and not just rushed through it. This is where the workbook and DVDs come in useful, to study them before the lesson, which means you spend more time driving and not parked up listening to theory. From the first meeting with Hannah I felt at ease as choosing the right instructor is key. Hannah was always on time and ready for the lesson. While driving Hannah was very clear on what was going well and areas to improve on so I knew what to study before next lesson. It was always a relaxed and calm lesson which made it easy to learn and take more in so, progress was always made. I highly recommend learning to drive with Hannah. I passed first time after completing the test booster course. Hannah is a great instructor, she is patient, attentive and tailors the lessons to suit your development. 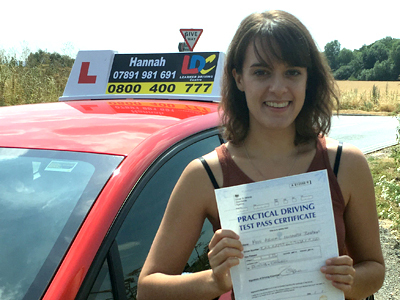 I thoroughly enjoyed our lessons, as Hannah is very approachable and encouraging. I was a bit sad that we didn't have any more lessons after I'd passed. 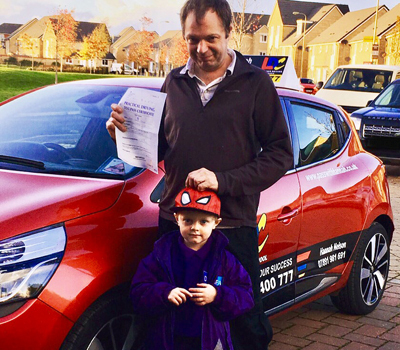 The test booster course was perfectly suited to my situation, having previous experience with other instructors and feeling relatively confident behind the wheel. 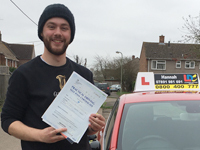 It was great that the test is organised by the instructor, as this was a factor in not having taken the test sooner. The resources made available were also very useful. If you are looking to pass your driving test; learn to drive with Hannah. I had a great experience learning with LDC, and passed after taking a 15 hour test booster course and a few additional lessons. I had previously done some lessons in a different area before taking a break, so this course was ideal to refresh my skills and get familiar with the roads. Hannah was a friendly and patient teacher, and worked with me to plan the lessons so I could get what I wanted out of them. She explained how to approach different skills and situations in a calm way and was always supportive and positive when explaining how to improve, which helped to build my confidence. The lesson prices were reasonable and in line with other instructors in the area, and by booking larger amount of hours with a course I was able to get better value for money. I also got to use the course book, which had lists of different skills you needed so you could check your progress and use them to help plan your lessons. 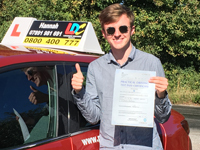 Overall I would recommend LDC based on my experience, and have recommended Hannah to friends in my area who are looking to learn to drive. Thanks Hannah!